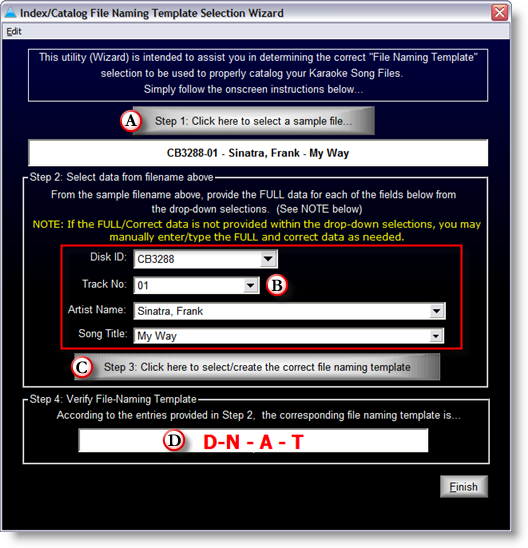 This utility (Wizard) is provided/intended to assist you in determining the correct "File Naming Template" selection to be used to properly catalog/index your existing Karaoke Content files (Song Files). 1. Click button (A) to locate a sample Karaoke Content file. IMPORTANT! Be sure to select a file that best represents the "File Naming Format" utilized by the files you wish to index/catalog. 2. Utilizing the information provided within the sample filename, enter the field data into the Disc ID, Track No., Artist Name, and Song Title fields as applicable. REMINDER: You may be able to select the appropriate field data from the "drop-down" selections, however, depending on the special characters/delimiters utilized within the sample filename, it may not be possible for CompuHost to correctly identify the correct field data. If the full and correct field data is not provided within the drop-down selections, manually enter the field data as needed. 4. If the correct and complete information has been entered in step 2 above, the correct and compatible "File Naming Template" will be provided onscreen (D). 5. If the File Naming Template appears correct click "Finish", otherwise repeat steps 1-3 as needed.